Ahmedabad Railway Station is a train station. It serves as the primary railway station of Ahmedabad, Gujarat, India. Also referred to as the Ahmedabad Junction Railway Station, it is an important center of the Western Railways zone under the category of the Indian Railways. The locals refer to this station as Kalupur Station. 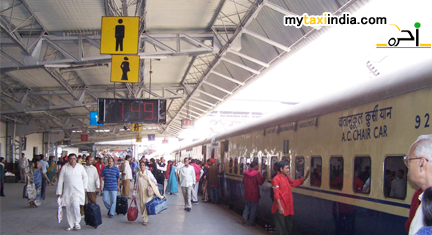 The train station serves trains that connect Ahmedabad to various parts of Gujarat and many major Indian cities of the country including Mumbai, Bangalore, Delhi, Kolkata, Chennai, Kochi, Hyderabad, Kochi, Visakhapatnam, Dhanbad, Indore, and Daltonganj. The station possesses 12 platforms. The facilities in the station include snack bars, tea stalls, medical shops, and enquiry desks. The station also includes a cybercafe run by Tata Indicom. Presently, the government is planning make the station WiFi enabled and include new ATM outlets from renowned banks such as Canara Bank, ICICI Bank, Union Bank of India, Bank of Baroda, Dena Bank, State Bank of India etc. Recently, the station has launched hand push luggage trolley service. There are a huge number of places of tourist interest in Ahmedabad. Ahmed Shah's Mosque is an attractive mosque of Ahmedabad located in Bhadra fort. It was built in 1414 AD Ahmed Shah, the founder of city Ahmedabad. Bhadrakali Temple is located inside Bhadra Fort built under the rule of Aazam Khan. The Rani Sipri's Mosque is another tourist attraction here. It is a beautiful amalgamation of Hindu and Islamic styles of architecture. Once in Ahmedabad, you must visit Sidi Sayed Jhali. It is an important mosque in the city. Akshardham Temple is located at Gandhi Nagar that witnesses over 2 million of visitors annually. It is an architectural masterpiece where you will witness the best Gujarati architecture. Swaminarayan Temple is world renowned temple situated at Kalupur. Built in the 19th Century, it makes for a crucial tourist destination. Other places of tourist interest in Ahmedabad include the Hatheesing Jain Temple, Victoria Garden, Law Garden, Bal Vatika, Shanku's Water Park, Chandola Lake, Kankaria Lake, Nalsarovar Bird Sanctuary, Kamla Nehru Zoological Garden, and Runn of Kutch Desert Wildlife Sanctuary. Hiring a taxi in Ahmedabad will help you enjoy the tour in Gujarat and areas around better. At My Taxi India, we provide our clients with unprecedented car hire and railway transfer services to travellers. Our primary motive is to guarantee you a safe and 100 per cent pleasant tour experience without burning a hole in your pocket. Our fleet of cars will be at your doorstep as per your requirements and budget. The team of chauffeurs is highly experienced and skilled in their field of work. We are also backed by 24 x 7 customer care team, and engineers to monitor condition of vehicles. Book a taxi with MY Taxi India now and experience the difference.